Hyperallergic reached out to the group via email and asked how the letter came about. “A number of politically activated artists are in Venice now to view and/or participate in the Biennial and related events such as the Creative Time Summit, Gulf Labor panels, etc. They began having discussions about this topic and initiated the letter discussion,” the group explained. 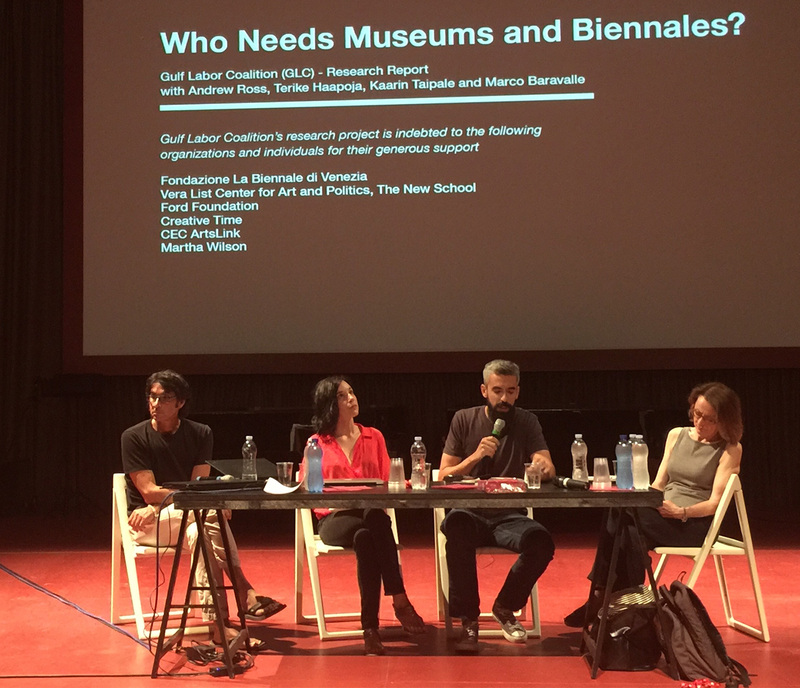 The letter was read by NYU Professor Andrew Ross on August 9 (see the video above) during the “Who Needs Museums and Biennales?” panel organized by Gulf Labor at the Venice Biennale. During an August 12 event at the Press Room — a parallel arts program that was held during the opening week of the Biennale and again as an auxiliary event during the current Creative Time Summit — Mariam Ghani talked about the “Artists’ Letter for Palestine.” Artist Pedro Lasch, another Summit participant who is one of the letter’s signatories, was also there to address the issues with Ghani and the Press Room audience. Bringing practitioners across the fields of visual art, cinema, music, theater, dance, and performance, the events of the 1974 Art Biennale were spread across the entire city of Venice. Today, this remarkable and transformative episode in the history of the Biennale is largely forgotten. The dedication of the program of events to Chile and against fascism remains one of the most explicit attempts, in recent memory, by which an exhibition of the stature of the Art Biennale not only responds to, but courageously steps forward to share the historical stage with the political and social contexts of its time. It goes without saying that, in view of the current turmoil around the world, that the Biennale’s Eventi del 1974 has been a curatorial inspiration. We write to you as artists and cultural workers, regarding PACBI’s (Palestinian Campaign for the Academic and Cultural Boycott of Israel) call for a boycott of Israeli institutions. Many of you are already signatories. PACBI is the cultural and academic component of the BDS (Boycott, Divestment and Sanctions) movement, initiated by Palestinian civil society as an appeal for international solidarity. We ask you, first of all, to sign on as artists participating or attending to pledge non participation in exhibitions and other cultural events that are sponsored or funded by the state of Israel. Please note that this is not a boycott of Israeli citizens. We also ask you to pass this on to other Biennale participants to add strength to its eventual circulation throughout the artworld. The goal here is to collectivize the voices of our community. As artists, we have some leverage to bring global attention to injustice. Following the repudiation, by artists and curators, of Israeli state funding at last year’s Biennale de São Paulo, it is appropriate to bring the BDS spirit to Venice, where the stateless are obscured by the radiance cast by the national pavilions, and where the theme of “All the World’s Futures” has been widely interpreted by participants in the spirit of social justice. This is a critical moment to ask our community and artworld institutions to respond publicly to the call to take a stand against the Occupation and Israeli policies. Our voices are part of a long legacy — note that boycotts are never the first step, they arise after repeated negotiations prove fruitless. In particular, we write out of respect for, and in continuity with, a boycott effort begun in 2001 (before PACBI was launched) by ART ACTION. We aim to build on their effort in a more public way, using the Venice Biennale as a platform to launch this statement. In the interest of preempting a selfparalyzing conversation, let us acknowledge that native people were displaced from their homes to make way for those fleeing the persecution of Jews in Europe and elsewhere, including the horrors of the Shoah. While we acknowledge the genocide of Jewish communities, we believe that the settlers’ suffering in other lands does not vindicate the displacement, dispossession and killing of Palestinians. The struggle against the Israeli occupation has a proud lineage that connects to five centuries of resistance against religious persecution and settler colonialism around the globe. We also continue the efforts of other artworld campaigns: those who successfully boycotted the 19th Biennale of Sydney in protest against its sponsors Transfield Holdings, manager of mandatory detention centers for asylum seekers; members of Liberate Tate, who have pledged to “free art from oil”; and Gulf Labor, a group that refuses to cooperate with the Guggenheim Abu Dhabi until fair working conditions and wages are secured for the foreign nationals building the museums on Saadiyat Island. Before these, we had the Guerrilla Girls, the Art Workers Coalition, and so many others who have refused to cooperate in the face of institutional racism, sexism, and labor exploitation. To those who believe that engaging with Israeli institutions would be part of a useful dialogue, or that the boycott will further isolate propeace voices within Israel, we caution against the use of your work to convey an appearance of free speech at a time when war crimes are committed daily. Artists’ creative expression is being used to whitewash and normalize the brutality of the Occupation. The reality is that only certain viewpoints enjoy freedom of expression in Israel; being an advocate of PACBI/BDS is not one of them. It is not anti-Jewish to be critical of Israel. It is time to fully differentiate Judaism from Zionism. For sure, criticism of Israeli policies has been used to serve those with racist agendas, and it is essential that BDS supporters be vigilant against this. We acknowledge the historical basis for Jewish fears but caution that these concerns should not be manipulated to cast doubt on the moral goals of the campaign itself. We condemn the use of any anti-Jewish or anti-Muslim rhetoric in connection with the BDS campaign. Scholars have taken the lead in responding to the PACBI call to boycott Israeli institutions, and other sectors (governments, communities of faith, trade unions, banks, and branches of commerce) are signing on to the general BDS campaign. The boycott is now spreading to the general population in countries all over the world. Yet, with a few notable exceptions, the institutional artworld has held back. We all know that your support carries some level of personal or professional risk. This risk is critical to the boycott tactic, and is currently being borne by Israeli BDS advocates, including artists, who are persecuted and criminalized for participating in Boycott from Within Israel. Please consult the guidelines set out by PACBI (at http://www.pacbi.org/) and note that they allow for signatories to choose their own level of engagement.